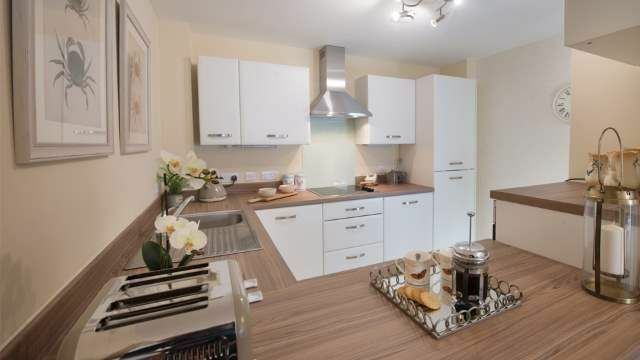 Located at Westfield Road, Wellingborough in the East Midlands, the apartments at Rosebud Court combine the best of rural living with all of the luxuries of urban convenience. For every day shopping there are two small convenience stores within a short walk of the apartments and a larger supermarket just 750m away. Each apartment is designed especially for the over 60s with thoughtful detailing including raised plug sockets and slip-resistant flooring. Rosebud Court is equipped with camera entry systems and lifts to all floors, making day-to-day living as comfortable as possible, a well designed Homeowners' Lounge for socialising, whilst the on-site guest suite provides a welcoming reception for visitors and family members alike. Enjoy a leisurely stroll in the communal landscaped gardens or stay cosy indoors and enjoy the benefits of Sky and Sky+ connection points. Selected apartments also feature luxurious walk in wardrobes. With fully fitted kitchens, energy efficient heating, double glazing and integrated fridge freezers, the latest McCarthy & Stone Retirement Living development offers all of the luxuries of independent living with the benefit of a House Manager and a 24-hour call system for added assistance and peace of mind. Our Show Complex is open 7 days per week, 10.30am - 5pm. Call us on to book your tour, or simply pop-in at a time convenient for you. The beautiful town of Wellingborough dates back to medieval times and has now become a thriving small town in the heart of the picturesque East Midlands. With a pretty town centre that features a good selection of shops including Morrisons, WHSmith, Boots and Costa coffee, Wellingborough is a convenient place to live. For days out with friends and family there is also a great selection of cafes, restaurants and local boutiques. Wellingborough is located just 10 miles East of Northampton and offers a good network of bus services around the town and further afield. For day trips and weekends away Midland railway offers regular services to London St Pancras, departing every 30 minutes as well as connections to Bedford, Luton, Kettering, Corby, Leicestershire, Nottingham, Derby, Sheffield and Leeds. Property descriptions and related information displayed on this page, with the exclusion of Running Costs data, are marketing materials provided by McCarthy & Stone - Rosebud Court, and do not constitute property particulars. Please contact McCarthy & Stone - Rosebud Court for full details and further information. The Running Costs data displayed on this page are provided by SmartNewHomes to give an indication of potential running costs based on various data sources. SmartNewHomes does not warrant or accept any responsibility for the accuracy or completeness of the property descriptions, related information or Running Costs data provided here.